“Magnificent Dogs” by Huskyteer is the first story, the title a direct allusion to Those Magnificent Men and their Flying Machines. Right before the dawn of WWI, workaholic airplane designer Whipple (Lab) and his star pilot Mick (German Shepherd) struggle to build and pilot a plane fast enough to win a contest and score a government contract. Whipple is unhappy with how he labors in anonymity, neglecting his wife and children, while the pilot gets all the glory. Mick the pilot is unhappy that the spotlight of being a famous pilot forces him to remain deep in the closet and hide his relationship with Whipple’s assistant. Will everyone have it together the day of the big race? I won’t post spoilers. 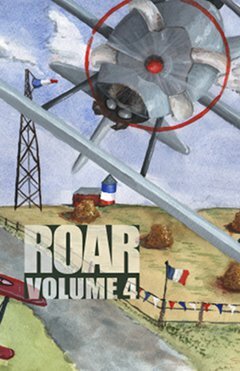 “Phantom” by Benjamin “eSca” Reed is another story with a dog protagonist, this time set in a contemporary furry world that’s also fighting terrorists in the Middle East. The protagonist is a member of the “Alpha Pack” that killed their version of Bin Laden, but for security reasons he can’t take public credit for the deed. He’s also suffering severe PSD flashbacks from the raid, and decides to leave the service due to it. Any other information would be spoilers, but suffice to say this was an enjoyable entry in the book. “St. Kalwain and the Lady Uta” by Mary E. Lowd. High fantasy about a cursed werewolf who must redeem himself through heroic deeds. This one didn’t end quite like how I’d expected. Another decent story. “Chasing the Spotlight” by Tim Susman. This was probably the most unusual story in the anthology. The owner/reporter of a popular online newsrag manages to track down someone who’s undergone experimental surgery to become their furry alter-ego. I can’t help but think this is a commentary on the RL person who had extensive plastic surgery to turn into their totem animal, with less than stellar results. Definitely one of the darker stories presented. “Second Chance” by Sean Silva. A cheetah anthro NASCAR driver among mostly human competitors. Since I have no interest in and little knowledge of car racing, this story didn’t do a lot for me. The protagonist is burned-out and not particularly likeable, and there’s a gruelling multi-page dialogue scene where the cheetah’s manager tries to talk him into doing one last big race, despite knowing it could be potentially dangerous to himself and the other drivers due to his mental state. Not the most responsible thing to do. “Savior of Dragondom” by Sarina Dorie. A high fantasy pastiche of Pern and other noble-dragon-companion books, only this time the long-suffering noble dragon is stuck with a class-A jerk due to a prophecy. This was a fun read, in both how over-the-top obnoxious the dragonrider is, and how the dragon tries to deal with it. One of my favorite stories in the book. “Almost Famous” by Eric Kern. Contemporary slice-of-life set in a furry world. Kevin Hale (bull) has a humiliating fall in mud captured on camera and uploaded by his ‘best friend, ‘ and has to try and deal with being the laughing stock of his office for days on end. A new student enrolling in his college helps him see what happened in a different light, and offers an unexpected chance for fame of a different sort. “Best Interests” by Whyte Yoté. Set in a mixed human/anthro world, supposedly some time in the future, but for all intents and purposes a contemporary setting. A lion becomes the first anthro president-elect. That by itself is a heavy burden, but it’s complicated by the fact the lion is a closeted homosexual, and he is having a lot of trouble breaking off a relationship with an obsessed ex-lover that has the potential to be a huge scandal and cast a pall on his forthcoming presidency. The best thing to do may not always be the right thing. “The Gentleman and the Gypsy” by NightEyes DaySpring. Not entirely sure when this is supposed to be set, but probably sometime from the turn of the century to the 1920’s in London. The oldest son of a wealthy fox businessman is slowly learning the family trade, and when he’s sent on his first solo trip to represent his father’s business concerns he has a crisis of conscience over how his choices affect other people’s lives. A childhood friend reappears in his life to catalyze his feelings, and he has to figure out what he really wants to do with his life. “Inheritance is What You Leave Behind” by Jesse “Tango” Stringer. Contemporary furry story. A superstar actor (husky/wolf) unexpectedly returns to his small town home to find the son he never knew he had. The father-son reunion is facilitated by a beloved teacher at the high school, and the secondary story involving the teacher is actually a lot more touching than the father-son reunion. “Seeing-Eye Dog” by Kandrel. A reclusive, blind author (Dalmatian Chris) is trying to deal with the death of his long-time guide dog, and reluctantly allows a live-in helper (German Shepherd Malcolm) assigned to him by his doctor to stay until a new guide dog arrives. The author is very hostile and bitter, and keeps his disability a secret from everyone, including his publisher, because he doesn’t want to be known as ‘the blind author’ (which seems a reasonable, if unrealistic, desire). Lots of arguing with the helper ensues, as the shepherd tries to get him to come out of his shell. As with some of the other stories here, there are no easy or pat answers to difficult questions. “Crooked Pictures” by Alfor Aalto. A technique to record people’s memories is developed, and fortunes are made selling the memories of famous people. A star-struck doctor gets the chance to do the memory transfer of a beloved starlet, only to discover all that glitters isn’t really gold. Not a new idea, but still well told.